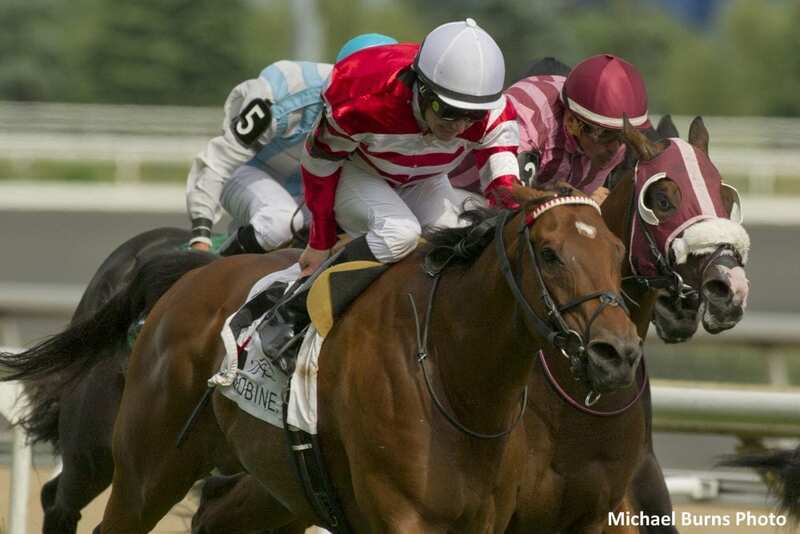 Riverside Bloodstock's Dimension was the 20-1 upset victor in Sunday's Grade 2 Connaught Cup at Woodbine Racecourse. Off as the longest shot in the field, since he hadn't so much as hit the board since 2014, the 8-year-old son of Medicean rallied up the outside to win by a half-length, posting a final time for the seven furlongs of 1:21.84 over the firm turf course for owner/trainer Conor Murphy. Ridden by David Moran, Dimension was off very slowly, and found himself at the back of the field in the early part of the race. Moran was very patient, allowing the gelding to find his stride and relax before asking him for his best. Meanwhile, heavy favorite Stacked Deck was very quick off the blocks to gain the early lead, setting a relatively slow first quarter time of :24.15 with Glenville Gardens just a length back. Stacked Deck got a bit of pressure from Glenville Gardens approaching the half-mile mark, urging him through the fraction in :46.83. Rounding the turn for home, Stacked Deck blew the turn badly, carrying Glenville Gardens on his outside nearly six-wide into the lane. Dimension waited until those two had straightened out, then came gunning for the lead alongside Passion for Action down the center of the class. A gutsy performance kept Dimension a half-length in front of Passion for Action at the wire, with Bye Bye Bernie closing up the rail for third. Bred in Great Britain by Cheveley Park Stud, Dimension is out of an unraced daughter of Green Desert, a Group 1 winner at Newmarket in the late '80s. The gelding's career record now stands at 6-6-1 from 32 lifetime starts, with earnings of just under $500,000. This entry was posted in Racing and tagged barbara minshall, bye bye bernie, Connaught Cup Stakes, Conor Murphy, David Moran, Dimension, Luis Contreras, stacked deck, woodbine by Paulick Report Staff. Bookmark the permalink.